The Familias con Esperanza project was started as a response to the needs of the whole family in Manchay. As we spent time with the parents of the children that we work with, we found that the change in the kids was of course greatly influenced by positive change in their parents. "FE" offers a variety of classes, workshops, and events aimed at helping and encouraging, and ultimately at sharing God's love with the parents of the children who attend the care center. We offer sewing classes, computer classes, and a micro-business class complete with micro-loans. Through this program we offer family and marriage counseling, as well as mentoring relationships and discipleship with our "FE" staff. Many of the children's mothers have graduated from the sewing class, and through our sewing workshop are able to produce items to sell, as a way to support their families. 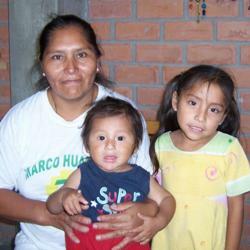 Support the Ministry of Keeping Families Together Peru with Your Gift Today.